Calendar of Treasury Books, Volume 15, 1699-1700. Originally published by His Majesty's Stationery Office, London, 1933. Report to the Treasury Lords from John Povey (in the absence of William Blathwayt) on the memorial of Mr. Brooks. As Receiver General of the public revenue in New York he has yearly transmitted four quarterly accounts of the public revenues arising there by the Customs, Excise, the King's Beam, Quit Rents and such Aids as have been sent thither from the adjacent Colonies for the security of the frontiers of that Province, to wit from 31 Jan. 1690–1 (when he first entered upon that Office) to 7 June 1698 when he was suspended by the Earl of Bellomont. These quarterly accounts are all certified by the Deputy Auditor to be truly stated and Col. Fletcher has certified to most of the said accompts during his Government that he believes them to be true charges and discharges of the revenue for the respective quarters. 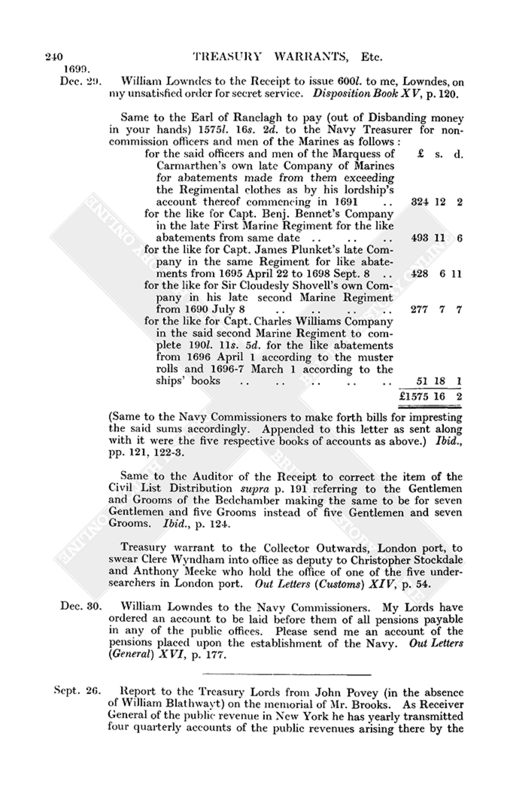 The accomptant has also produced a receipt from Mr. Cortland (one of the present Commissioners for the receipt of said revenue) for the balance [remaining on the foot] of said accompts. The accomptant has further, since his coming into England, delivered in an accompt of the Additional Duty raised by several Acts of Assembly in New York in 1692 and since [that year], for payment of the debts of the Government and other uses expressed in the said Acts and an accompt of the taxes raised by public rates by Acts of Assembly in New York for the security of the frontiers during the war; which accompts I have examined with the vouchers produced by him. I have made several objections thereto as below. In reply the accomptant's agents allege that they are ready to answer provided they may have time to send to New York for the vouchers that are wanting. Whereupon your Lordships being attended with a short abstract of the said accompts you ordered copies of same to be sent to the Earl of Bellomont for examination with [by] the accomptant's vouchers in New York. Those accompts are now ready to be sent to said Earl. To save him trouble and expense his vouchers may be examined here rather than sent to New York. In this case he may be allowed time to send to New York to complete his said vouchers. Followed by: objections to Mr. Brooks' accompts of the revenue [of New York]. The accomptant produces regular orders and receipts for these [abovesaid] payments justifying himself thereby for having paid the same according to his Instructions except for his own salary, &c.
Memorandum: there is a further deficiency in the voucher produced for 60l. per an. allowed to the Minister of Albany which appears to be received by Mr. Clerkson the Secretary as his [the minister's] Attorney: but the letter of attorney is not produced as a voucher. 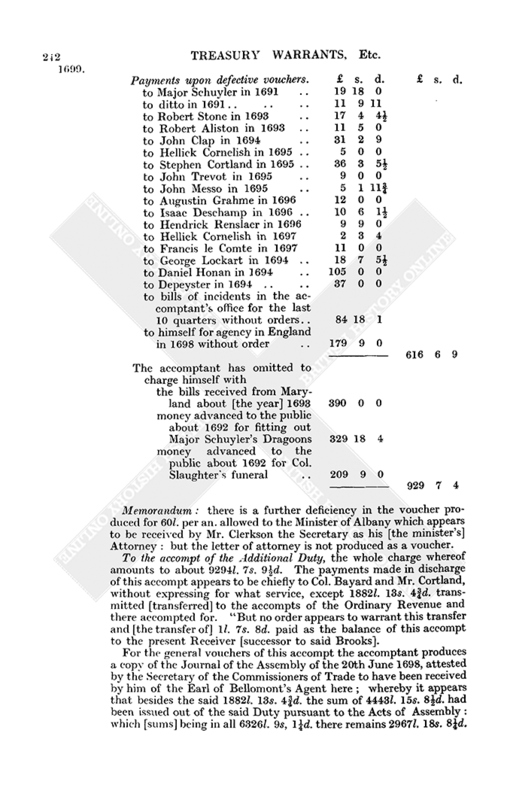 To the accompt of the Additional Duty, the whole charge whereof amounts to about 9294l. 7s. 9½d. 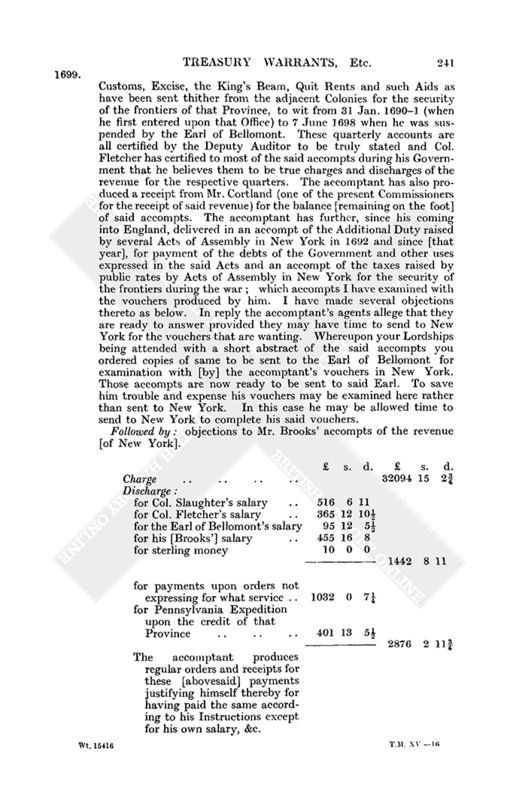 The payments made in discharge of this accompt appears to be chiefly to Col. Bayard and Mr. Cortland, without expressing for what service, except 1882l. 13s. 4¾d. transmitted [transferred] to the accompts of the Ordinary Revenue and there accompted for. "But no order appears to warrant this transfer and [the transfer of] 1l. 7s. 8d. paid as the balance of this accompt to the present Receiver [successor to said Brooks]. 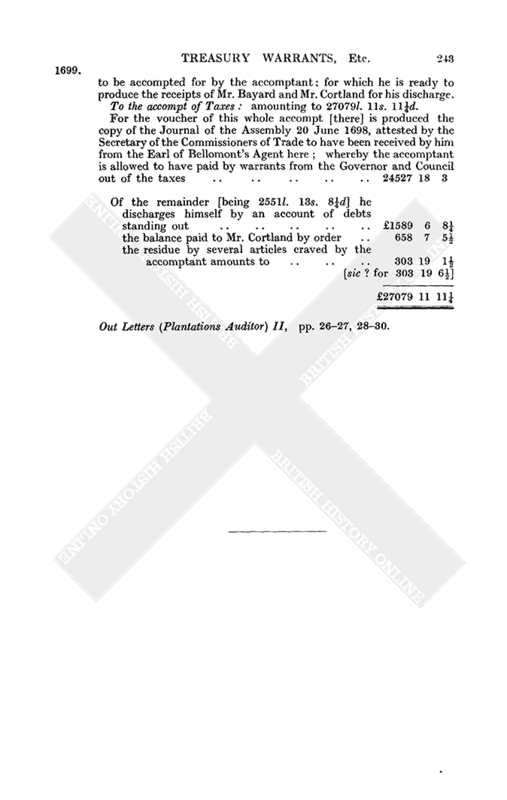 For the general vouchers of this accompt the accomptant produces a copy of the Journal of the Assembly of the 20th June 1698, attested by the Secretary of the Commissioners of Trade to have been received by him of the Earl of Bellomont's Agent here; whereby it appears that besides the said 1882l. 13s. 4¾d. the sum of 4443l. 15s. 8½d. had been issued out of the said Duty pursuant to the Acts of Assembly: which [sums] being in all 6326l. 9s, 1¼d. there remains 2967l. 18s. 8¼d. to be accompted for by the accomptant; for which he is ready to produce the receipts of Mr. Bayard and Mr. Cortland for his discharge. To the accompt of Taxes: amounting to 27079l. 11s. 11¼d. Out Letters (Plantations Auditor) II, pp. 26–27, 28–30.